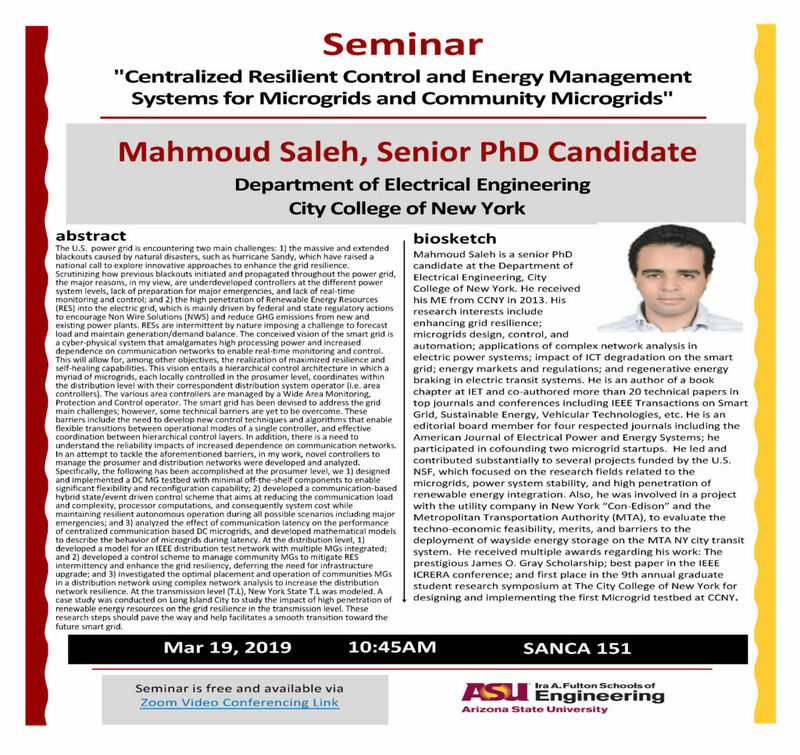 Please join Mahmoud Saleh, senior PhD candidate, City College of New York for the seminar, “Centralized Resilient Control and Energy Management Systems for Microgrids and Community Microgrids,” on Tuesday, March 19, 2019! The U.S. power grid is encountering two main challenges: 1) the massive and extended blackouts caused by natural disasters, such as hurricane Sandy, which have raised a national call to explore innovative approaches to enhance the grid resilience. Scrutinizing how previous blackouts initiated and propagated throughout the power grid, the major reasons, in my view, are underdeveloped controllers at the different power system levels, lack of preparation for major emergencies and lack of real-time monitoring and control; and 2) the high penetration of Renewable Energy Resources (RES) into the electric grid, which is mainly driven by federal and state regulatory actions to encourage Non Wire Solutions (NWS) and reduce GHG emissions from new and existing power plants. RESs are intermittent by nature imposing a challenge to forecast load and maintain generation/demand balance. The conceived vision of the smart grid is a cyber-physical system that amalgamates high processing power and increased dependence on communication networks to enable real-time monitoring and control. This will allow for, among other objectives, the realization of maximized resilience and self-healing capabilities. This vision entails a hierarchical control architecture in which a myriad of microgrids, each locally controlled in the prosumer level, coordinates within the distribution level with their correspondent distribution system operator (i.e. area controllers). The various area controllers are managed by a Wide Area Monitoring, Protection and Control operator. The smart grid has been devised to address the grid main challenges; however, some technical barriers are yet to be overcome. These barriers include the need to develop new control techniques and algorithms that enable flexible transitions between operational modes of a single controller, and effective coordination between hierarchical control layers. In addition, there is a need to understand the reliability impacts of increased dependence on communication networks. In an attempt to tackle the aforementioned barriers, in my work, novel controllers to manage the prosumer and distribution networks were developed and analyzed. Specifically, the following has been accomplished at the prosumer level, we 1) designed and implemented a DC MG testbed with minimal off-the-shelf components to enable significant flexibility and reconfiguration capability; 2) developed a communication-based hybrid state/event driven control scheme that aims at reducing the communication load and complexity, processor computations and consequently system cost while maintaining resilient autonomous operation during all possible scenarios including major emergencies; and 3) analyzed the effect of communication latency on the performance of centralized communication based DC microgrids, and developed mathematical models to describe the behavior of microgrids during latency. At the distribution level, 1) developed a model for an IEEE distribution test network with multiple MGs integrated; and 2) developed a control scheme to manage community MGs to mitigate RES intermittency and enhance the grid resiliency, deferring the need for infrastructure upgrade; and 3) investigated the optimal placement and operation of communities MGs in a distribution network using complex network analysis to increase the distribution network resilience. At the transmission level (T.L), New York State T.L was modeled. A case study was conducted on Long Island City to study the impact of high penetration of renewable energy resources on the grid resilience in the transmission level. These research steps should pave the way and help facilitates a smooth transition toward the future smart grid. 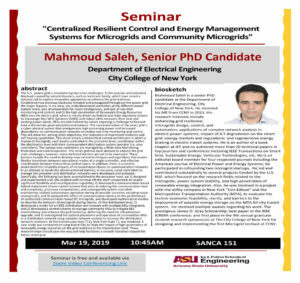 Mahmoud Saleh is a senior PhD candidate at the department of electrical engineering, City College of New York. He received his master’s from CCNY in 2013. His research interests include enhancing grid resilience; microgrids design, control and automation; applications of complex network analysis in electric power systems; impact of ICT degradation on the smart grid; energy markets and regulations; and regenerative energy braking in electric transit systems. He is an author of a book chapter at IET and has co-authored more than 20 technical papers in top journals and conferences including IEEE transactions on smart grid, sustainable energy, vehicular technologies, etc. He is an editorial board member for four respected journals including the American Journal of Electrical Power and Energy Systems, he participated in cofounding two microgrid startups. He led and contributed substantially to several projects funded by the U.S. NSF, which focused on the research fields related to the microgrids, power system stability and high penetration of renewable energy integration. Also, he was involved in a project with the utility company in New York “Con-Edison” and the Metropolitan Transportation Authority (MTA), to evaluate the techno-economic feasibility, merits and barriers to the deployment of wayside energy storage on the MTA NY city transit system. He received multiple awards regarding his work: the prestigious James O. Gray scholarship; best paper in the IEEE ICRERA conference; and first place in the 9th annual graduate student research symposium at The City College of New York for designing and implementing the first Microgrid testbed at CCNY.